This gorgeous catamaran offers exclusive PREMIUM service, with a continental breakfast served onboard, and our top-shelf premium all-you-can-drink open bar all day long. That means international brands, wine and more of the great cocktails that you love. With large luxurious netting up front, comfortable shaded seating in the rear of the boat, restrooms, a comfortable interior cabin and of course a great crew taking the best possible care of you, this will be a day spent in style...one you will never forget. 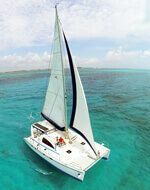 This beautiful catamaran can be chartered for full-day sailing trips to Isla Mujeres, snorkeling trips complete with spinnaker rides, or for amazing sunset cruises for up to 30 people. Boat: 42' Luxury Sailing Catamaran for up to 30 people. We also have larger and smaller catamarans for bigger and smaller groups! See More Private Catamarans. Tour Schedule: Daily on your schedule. Daytime snorkeling trips, Isla Mujeres sailing tours or fun Sunset Cruises available. Departs: Marina Albatros at KM 2.5 of the Cancun Hotel Zone. Pick-ups at La Amada Marina in Playa Mujeres or from Isla Mujeres are available free of charge. Exact directions will accompany your confirmation. Round-trip transportation from Cancun and the Riviera Maya hotels is available upon request for an additional cost. Duration: Half-day Charters are 4 hours. Full-day Charters are 7 hours. Premium Charters are 6 Hours. Premium Trip Includes Everything on Full Day PLUS: Best Value! Price shown includes up to 25 people. Each additional person is $120.00 $90.00 extra, up to a maximum of 30 people. Mandatory $11.00 per Person Docking Fee is Collected at the Marina in Cash on the Day of the Trip. Only if Snorkeling: Mandatory $2.00 per Person Marine Park Preservation Fee is Collected at the Marina in Cash on the Day of the Trip. Extra Cash for Marine Park and Dock Fees, Transportation, etc.